"The Government of Sri Lanka has permitted Tamils Rehabilitation Organization (TRO) to engage in rehabilitation and reconstruction work in LTTE controlled as well as military controlled areas of the northeast. But the Special Task Force (STF) is acting as an obstacle to our mission. In Trincomalee, Batticaloa and Thirukovil, the STF personnel grabbed relief supplies from us and diverted them to other refugee camps of their choice," said Mr. K P Reggie, Executive Director of TRO, at the press conference in Colombo on Wednesday evening. 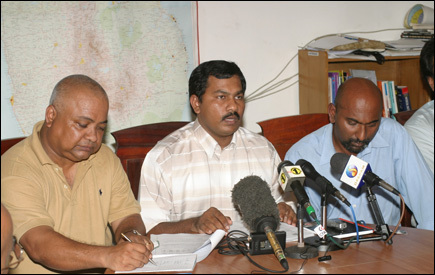 Tamils Rehabilitation Organization (TRO) called the press conference on Wednesday to inform the media and the international community about the activities of the Sri Lankan armed forces which is disrupting the tsunami relief work of TRO. Mr. C Pararajasingham, the Program coordinator of TRO and Mr. N Narendran of the Disaster Management Unit of TRO also participated in the press conference. "Although we appealed to the Sri Lanka Government for relief supplies on the same day the tsunami struck, no relief from the government has reached us. All the relief supplies we have are those we received from international organizations and the Tamil Diaspora. "It is only now that the government says they have sent relief worth ten million rupees. "Our organization is spending ten million rupees a day for our tsunami relief work. Can ten million rupees be called relief from a government in the face of the disaster we have faced" asked Mr. Reggie. "Our people have various needs. We are concentrating on all basic needsl. TRO is not discriminating among Tamils, Muslims and Sinhalese of northeast. We extend our help to all ethnic communities in northeast. "Soon after the tsunami disaster the government had called for a meeting in Colombo to discuss the relief efforts. Although NorthEast was part of the region that was badly hit, the Government personnel failed to even mention that residents of Killinochchi, Mullaitivu and Jaffna also have suffered in the tsunami disaster. While the government is speaking in terms of renovating houses and rebuilding roads of the tsunami hit south, our people in northeast are struggling without even temporary roofs over their heads and struggling to survive without basic facilities", he added.